ASD affects everyone differently. You are the one who understands how you interact with others and how you interpret situations. What is important in regards to communication is that most people around you are not on the autism spectrum so they communicate differently. As an adult with ASD you most likely take things literally in written and spoken formats, whereas a person without ASD is able to interpret the possible sarcasm and also the figurative meaning of oral and written communications. As an adult, during communication interactions you may have difficulty in predicting the outcome of communication whereas a person without ASD is able to predict the consequences of their communications and actions. Honesty is a common trait of a person with ASD whereas the non ASD person may not give an honest comment or response where it may hurt someone’s feelings. The non ASD person will attempt to give an honest response in kinder more diplomatic language. In communication exchanges there are a lot of non-verbal communication cues. A person with ASD will have difficulty interpreting facial expressions, changes in tone of voice and body language. Non-verbal communication can be a large part of a non ASD person’s communication and depending upon their individual personality, non-verbal communications can be quite extreme. Within a communication exchange eye contact is generally an expectation. The non ASD person considers eye contact an important part of the communication as it signifies interest in the other person and honesty. Eye contact can be very difficult for the person with ASD with known people and when encountering a conversation with someone new they may avoid eye contact altogether and could become quite anxious. 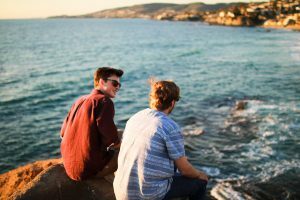 Generally, non ASD people are able to manage conversations, however those with ASD can find initiating, maintaining and exiting a conversation quite a challenge. Social situations can become quite overwhelming for adults with ASD as they are trying to interpret the social context and expectations while endeavouring to manage the conversation at the same time. These social interactions are managed easily by the non ASD person, however for the person with ASD it all has to be managed individually and brings to the situation a high level of anxiety.